For our local customers, this website represents a separate storefront from our physical location and is drawing directly from the available inventory of multiple national distributors. Although we have the opportunity to order in store anything you find here, there are literally tens of thousands of items displayed. We obviously cannot possibly have everything shown here in our physical storefront for you to walk in and handle before purchase. Online price matching not honored in store. As a local customer you are welcome to order through this website. However, please keep in mind that taxes, shipping & handling and all other appropriate fees will be present on your order. 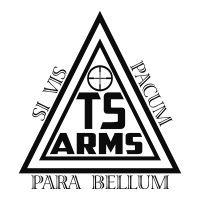 Thank you for visiting TS Arms! Simply browse through the website, find the product(s) you want and add them to the shopping cart. Once you are done shopping, click the on the Shopping Cart icon on the top of the page or click View Cart within the product. When you are in the cart, check your total on the right side. If you have over $750.00 of products, you are eligible to apply and click the Apply Now icon below your total. If your total is less than $750.00, click on the Home button and continue shopping to increase your order to at least $750.00. What are the interest rates and other terms of the loan program? The actual interest rate (Annual Percentage Rate) you will be charged is dependent on your FICO score and other underwriting criteria. Rates will range from 17.99% to 21.99% APR and your rate will be fixed for the term of your loan. The loan terms range from 12 to 36 months depending on your credit score and loan amount. The minimum loan amount is $750 with a maximum of $7,500. Is there a down payment required and are there any prepayment penalties for paying off a loan early? Depending on your FICO score you may be required to make a down payment on your purchase. You may pay off the loan in full at any time without penalty. How long do I have to spend my full approved loan amount? The loan that you were approved for is good for 90 days from the date you receive your pre-approval. You may choose to spend the full amount all at one time, or in increments over the 90 day period. Please note however that any additional financings during the 90 day period will be treated as separate loans, but will not require additional credit checks. Minimum financed amount must be at least $750. Be sure to read ALL of the loan disclosure information and feel free to contact us should you have any questions. Are there additional shipping costs, fees or taxes? Any shipping and handling costs charged by the dealer may be added to your final invoice. These fees will be included in the loan amount. Taxes will vary from state to state and there may be additional state or federal fees for items such as a short barrel rifle. Sandbar Acquisition Company does not charge fees of any kind. How can I check the status of my loan? Throughout the order process you will receive a series of emails informing you of your order status. You may also contact us Toll Free at (844) 223-2632 or info@sandbarllc.com. What happens to my loan if I return the purchased product(s)? Return policies on all purchases are determined by the individual retailer. If you return your purchase in accordance with the retailer’s stated policy, the dealer must return your loan funds to Commonwealth Ordnance Finance Company. If we receive your loan funds within the first 30 days of the initial loan disbursement we will cancel your loans and waive any outstanding interest charges. If we receive the loan funds from the dealer later than 30 days following the initial loan disbursement we will cancel your loan, but you will be responsible for any additional accrued interest charges. Likewise, if the dealer deducts any other fees from your loan funds (i.e. re- stocking fees, damage fees, etc. ), we will only cancel your loan in the amount refunded by your dealer and you will be responsible for making any additional payments.